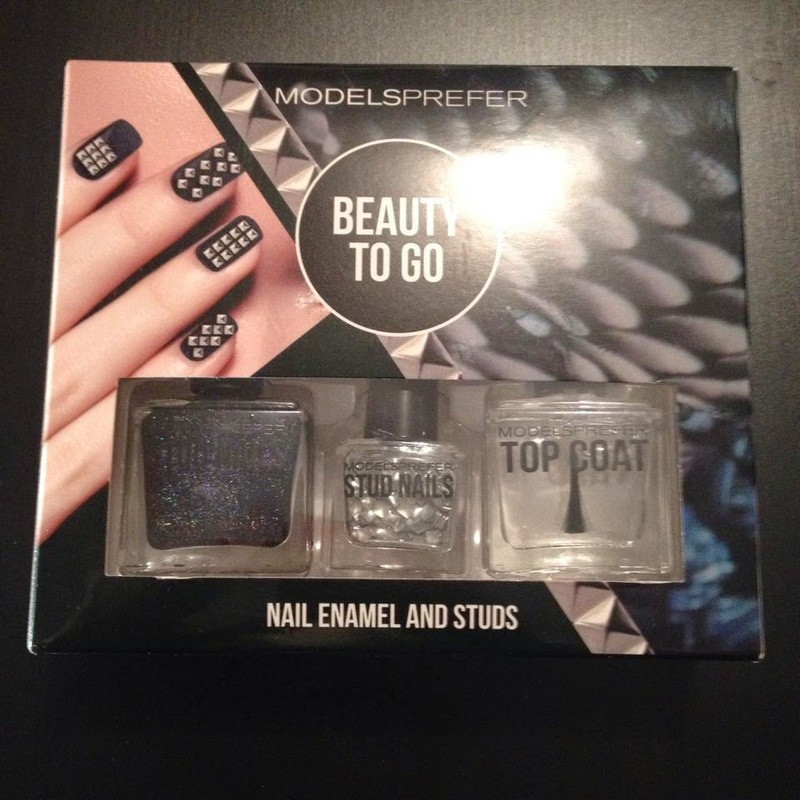 Hey guys, I've been wanting to get into some cool nail art designs etc for a while now and about two maybe three weeks ago I ordered some stuff online so I'm currently waiting for that in the mail, but I saw this little kit on sale for $10.00 at Priceline. (not sure how much this one was originally) and I couldn't pass it up.People have asked me how I did it, one girl grabbed my hand when I was paying for something demanding answers, so.... Here is a step by step of what I did. I was already wearing nail polish so I just cleaned that right off, then I trimmed my talons to this super short state right here. This is by the brand: MODELSPREFER. Its in their 'Beauty To Go' range. One thing I love about this is that in the top left corner on the box, there are some super cute nail designs there, just a little bit of inspiration if you need it. It come with this tool as well, I didn't know this was included because as you can see it doesn't show it anywhere in the packaging, so this was a nice surprise. This is used for placing the studs on the nail. 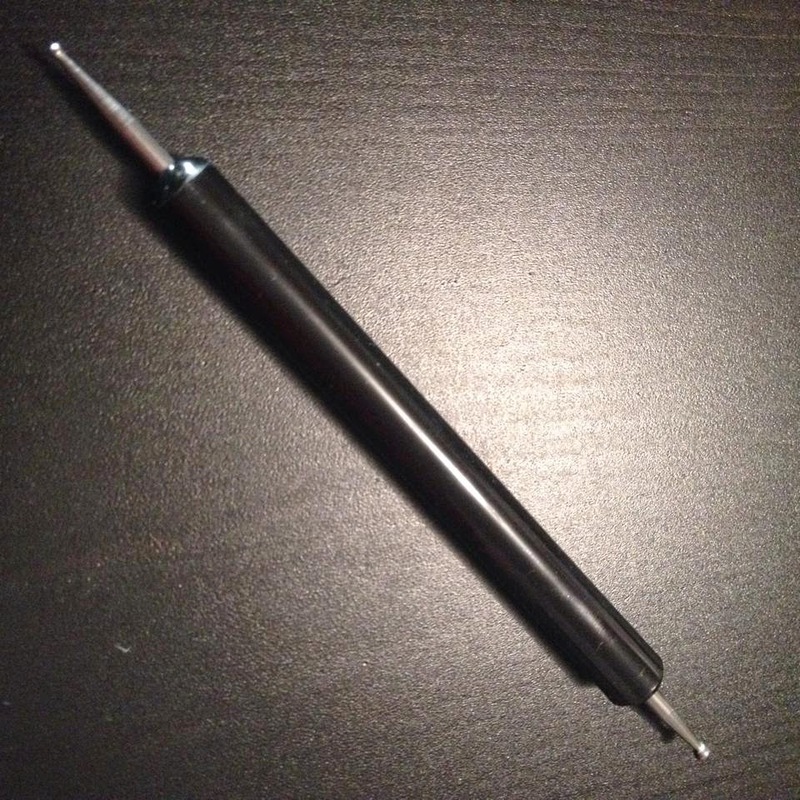 (Thats what I used it for anyway) Its a really handy tool for nail art in general, one end is slightly larger than the other, so it would be really good for 'dotting' nail polish and making little flowers - maybe I'll try that. Three little bottles, to which I adore the packaging. The first is the colour, it has some shimmer/glitter to it, but it isn't chunky or bumpy or anything, it looks quite nice just on its own. If you can purchase it as it is the colour is called "Heavy Metal". The last little bottle is one full of the 'studs' It is such a cute little thing and there are SO many studs in there, I was scared of wastage, but honestly, don't be. 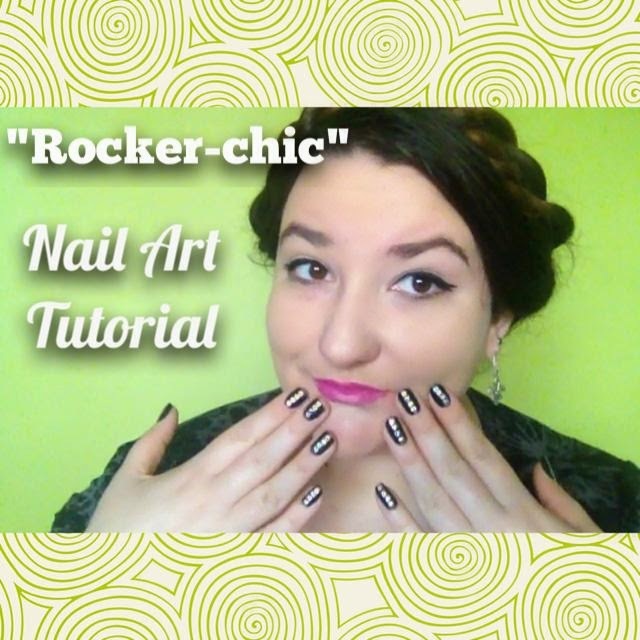 I also did all of my nails with about 4 - 6 studs each, so to me, that's using a lot, I might just do a simple 1 stud design next time or just an accent nail. The options are endless. 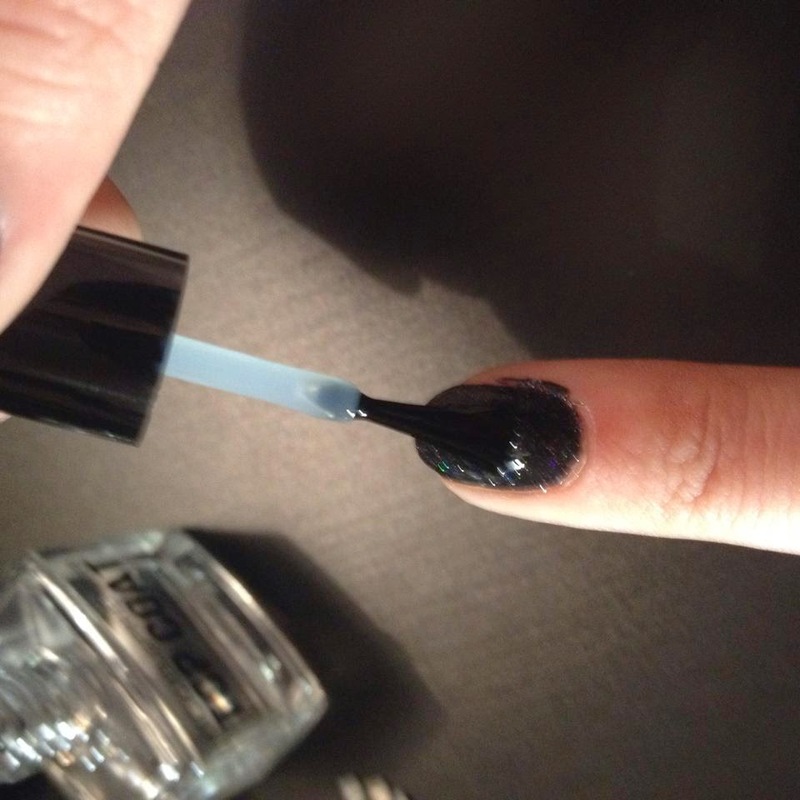 Firstly paint all your nails with the desired colour. In this case it is the one included in the pack (next time I might use a nice deep red colour). 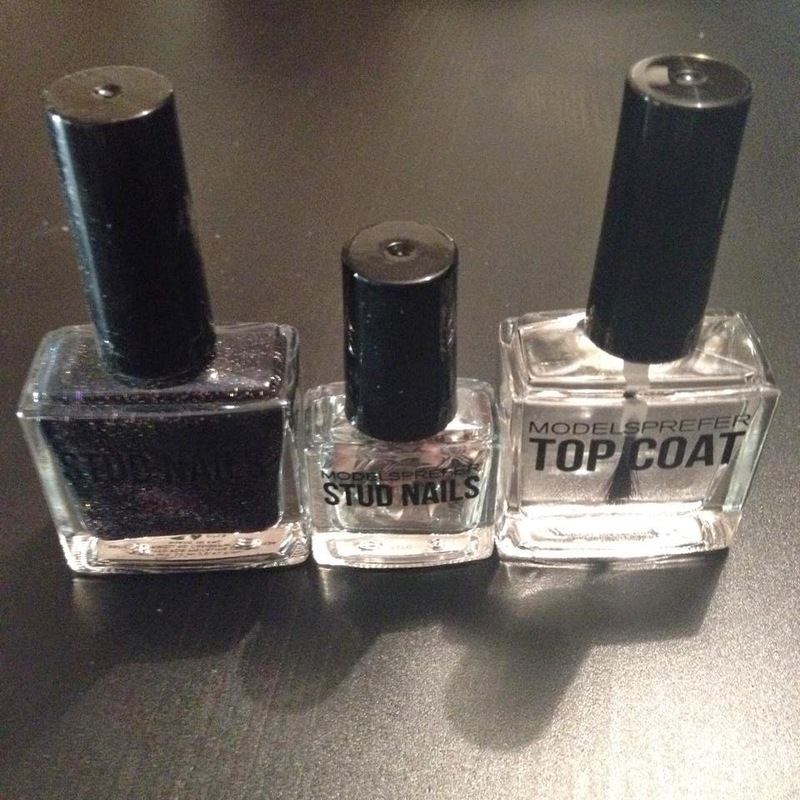 You're going to want to let the first coat dry, then coat each nail with a THIN coat of the top coat. Just to seal the first colour. Let that dry. 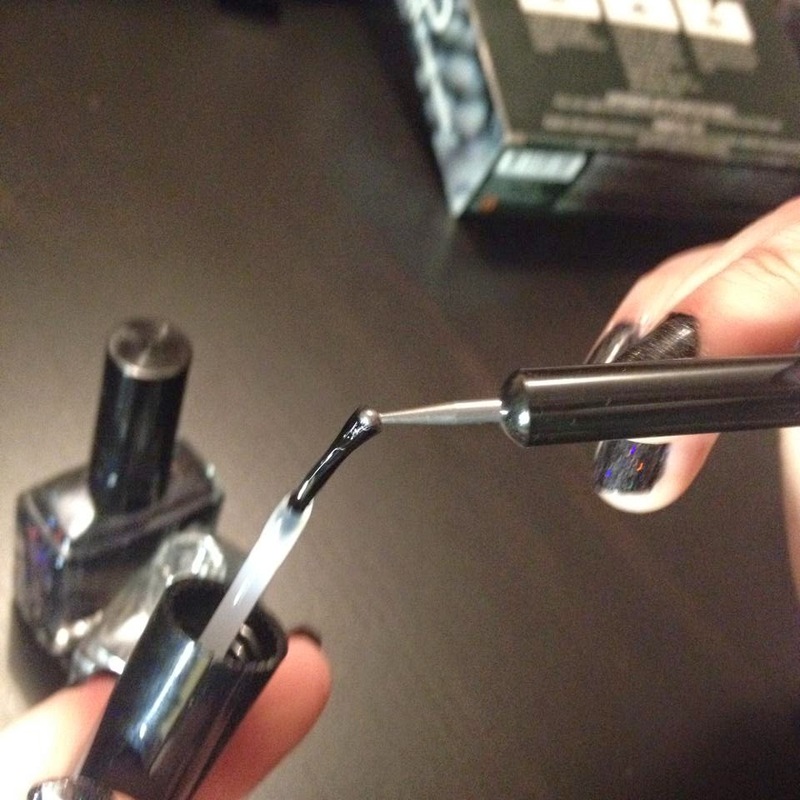 roll one end of the tool into the clear polish (I used the larger end) use that to pick up the studs and then place it into the still wet clear coat on your nail. It might sound like a bit of an ordeal but it honestly takes about 3 seconds to put the studs in place and as you do more of it, it is so, so easy. 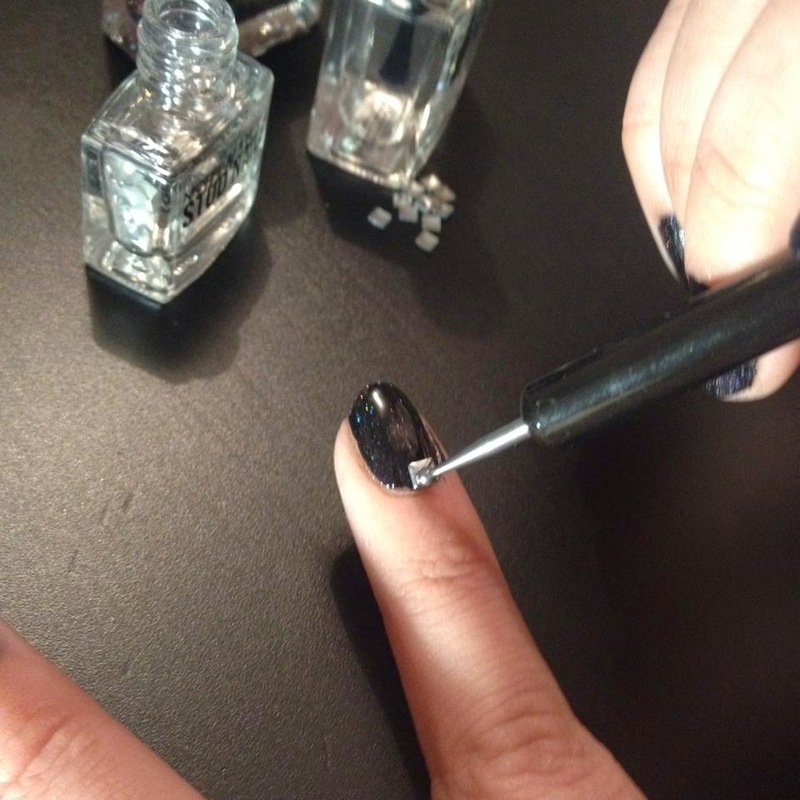 You only need to coat the tool in the clear polish, perhaps, once every few nails? Until it no longer picks them up. 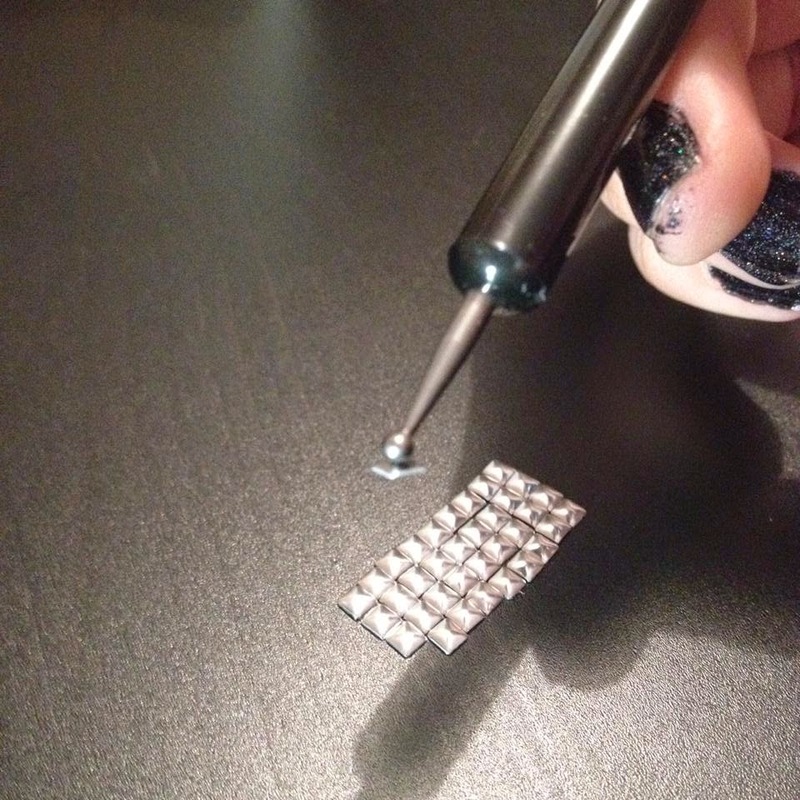 Using tool to press studs into clear coat. 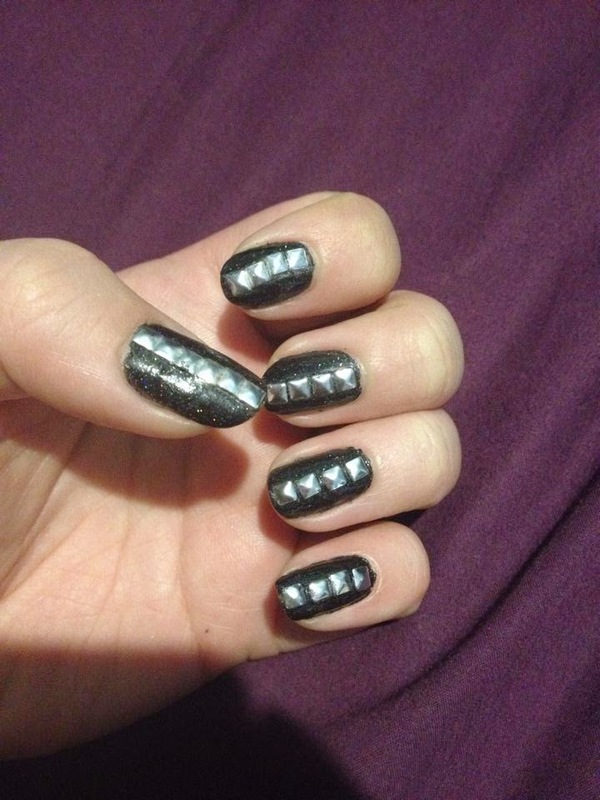 Told you I was messy, This is the un touched up just finished sticking them to my nails product. This is the design I chose to do. Once you have all the studs in place. 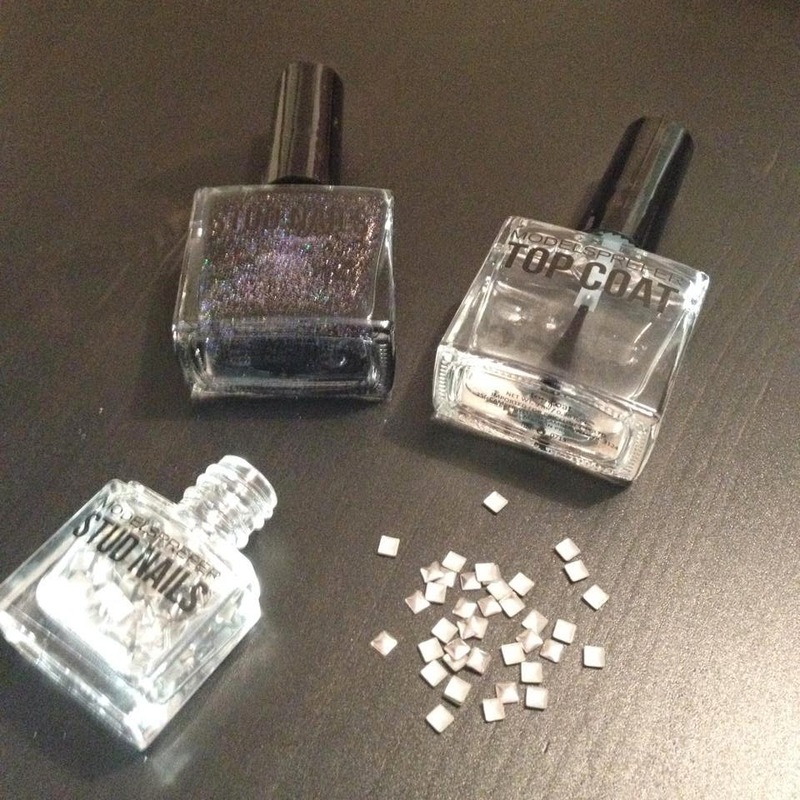 Let them set - making sure not to bump/wiggle them (some of mine moved but I didn't mind so much, while the polish is still 'wet' you can move them back in place) Now that they're all dry, put on a coat or two of the clear top coat to seal it all in place and Voila! You're done. Just clean those bad boys up! Finished Product! All cleaned up! 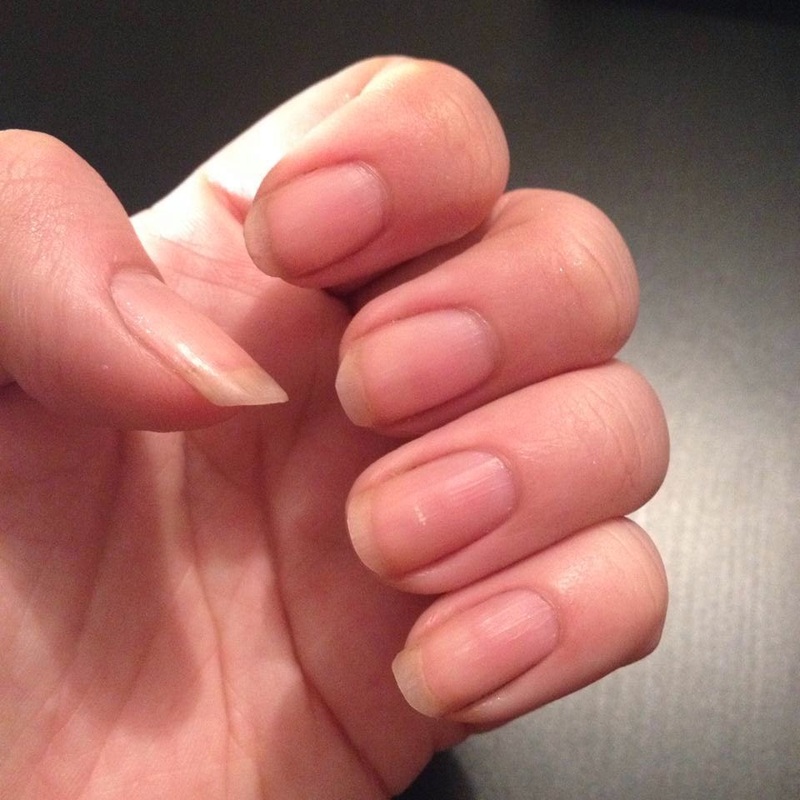 I took this photo two days after originally doing the nails, none have flaked off, although I've had some near misses. Mainly when I run my hands through my hair, because the hair is thin enough (obviously) it can flick up the studs. So be careful. 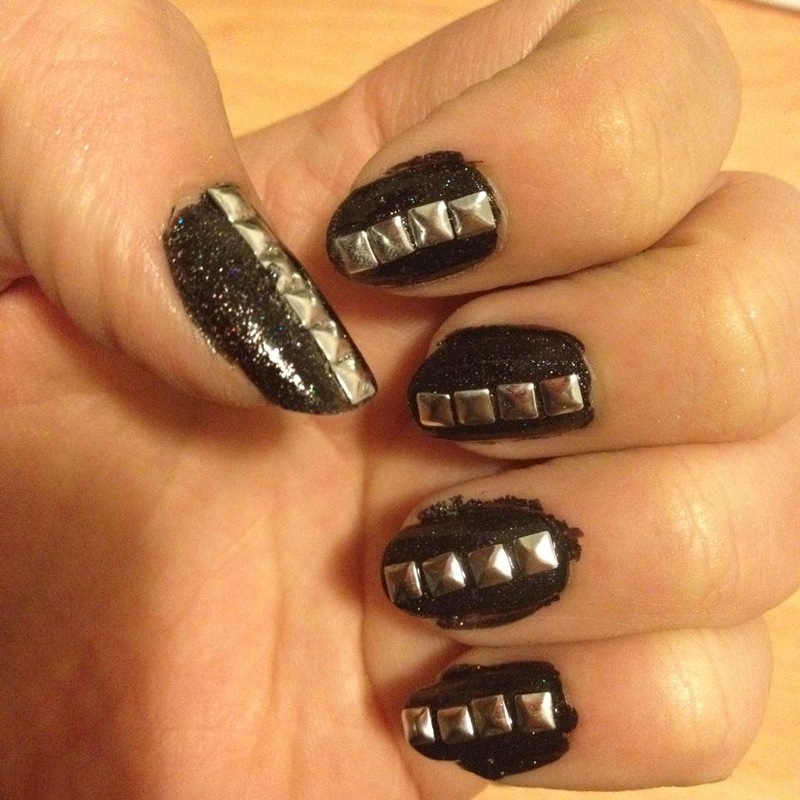 I might see if I can get my hands on some form of nail adhesive and give that a go. I hope you found this easy to follow and you give it a go yourself!